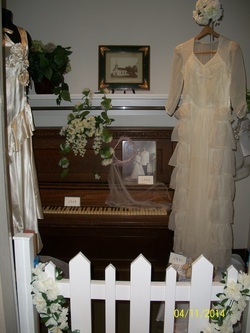 The Beachwood Historical Society is featuring two vintage wedding dresses. In addition, look for the photographs of the actual brides wearing the dresses on their Wedding Day. In the background, an Estey organ from 1908 can be seen. The Church that was once located on the corner of Richmond Rd. and Fairmount Blvd. is captured in a photo. Did you know that a bride and groom would drink a honey and mead mixture for a month? Honeymoons as a form of travel did not start until after the 1930's.